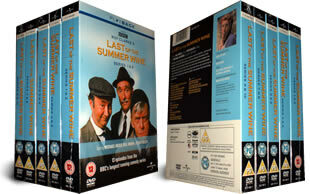 Please note this is 5 individual box sets making up the first 10 series of Last of the Summer Wine. Three elderly delinquents have a series of funny misadventures as they enjoy their retirement. The envy of their hen-pecked married friends, they embark on mischievous stunts as if in their second childhood. Old age never seemed so much fun! Features all the episodes from the eleventh and twelth series of the show. 16 DVD Set delivered to your door.